Size one diapers, and 0-3 month clothes, her pants are still huge around her waist but the length is perfect, she still fits in some NB stuff but she is pretty comfortably in 0-3 month sleepers and onesies. Blue! Pretty sure that will stay since everyone in our family has blue eyes...no joke everyone except my SIL. Light brown, and still getting lighter daily, her roots are SUPER blonde so home girl is rocking a little bit of an ombre. I think she is going to be a little tow head though...we will see! It is also super wavy/curly after her baths just like her big sisters, I think she got my hair. We have gotten to the 5 hour mark and one 7 hour stretch. Mostly it is between 4-5 hours at night, and then 3 to 3.5 during the day. I am happy if we get straight 4 hours of sleep at night, and I am looking forward to longer as she gets older! She usually starts out in her crib and then in the middle of the night feeding she will move to our room and eat on and off until Charlotte comes in around 7 am. Girl loves her food, she lets out THE loudest scream cry ever (seriously my hearing is awful in my left ear now ha) when she is hungry. She is pretty comfortably eating 4 oz at night, and then anywhere from 1-4 oz during the day. One night she ate almost 6 oz before her longest stretch of sleep yet. She can hold her head up super well, and giggles, smiles, sticks out her tongue, and coos and babbles to us. She hates falling asleep. She will cry and cry until she just passes out. Thankful for my boba wrap because she usually can fall asleep without problems in that so quickly. She loves her big sister and gives her SO many smiles. She also loves me, whenever I am in the room her eyes follow me everywhere and she will whine until I pick her up. I usually can get her to smile more than anyone else can. We mostly call her Elle, Elizabeth and Ellie bean. Char calls her "MY baby sister". 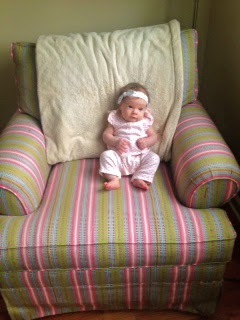 I cannot believe you are 2 months old already Elle! Although it seems like you have been with us forever, and we cannot imagine life without you in it!